New innovations and technologies in the digital marketplace surface frequently and require manfacturers, such as ourselves, to constantly re-evaluate and update our products with service offerings, and develop new tools for the industries we serve. We will continue to be a leading solution company- today and far into the future. We will continue working closely with our clients to deliver best-of-breed applications, and deliver the lowest prices so you can afford the very best in truly innovative technology. We will build both our service infrastructure and our customer satisfaction ratings, ensuring your continued success and satisfaction with GVS products. 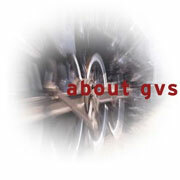 And GVS will be the one vendor that can help you build a total technical environment for creative professionals.